Over the past two years, I’ve been picking up hobbies left and right. I decide I want to “Get into X”, then buy all the gear necessary to exercise that hobby. Six weeks later, I move on and the hobby becomes a memory. Sometimes I cycle back to old hobbies, hoping to pick up a forgotten skill. As of today, the cycle includes: Figure Drawing, Cartooning, Watercoloring, Tailoring, Piano, Writing, Running, Cycling, Reading, Cooking, and Photography. When I first noticed this tendency to drop hobbies shortly after picking them up, I dismissed it as a natural consequence of my desire to diversify my life’s experiences, and thus wasn’t something worth fixing. The point was to keep my mind sharp and active, not to get good at a certain hobby. As I’ve matured though, I’ve realized that that line of logic was a cop-out I used to justify giving up. I never started a hobby expecting to drop it soon afterwards. When I do drop it, I usually do it out of boredom or frustration. Why is that? Why can’t I pick something up and stick to it long-term? Is that even feasible? How would I even fit time into my day for all these hobbies? How good do I really want to get? After mulling those questions over in my head, I decided that the next time a cycle came about naturally, I’ll ride it through, and I’ll try to take note of what was going through my mind. Soon after, I picked up photography: Bought the camera and a lens, started shooting, and sure enough 6 weeks later, it hasn’t left my desk in a week. I think I’ve figured out why I drop hobbies, and I have a hunch on how to fix it. Given a creative activity where the output is subjective, judging progress is difficult. Compared to a non-creative activity where the result is clear and progress is obvious, it becomes much harder to find motivation to continue investing time and effort when you don’t see that effort rewarded. For example, you either finish a 50 mile bike ride or you don’t, you either win a game of basketball or you don’t. Contrast that with judging a painting: When are you “finished”? How do you judge its quality? “Beauty is in the eye of the beholder” is another way of saying that creative works are judged against a personal criteria of taste, quality, and style. 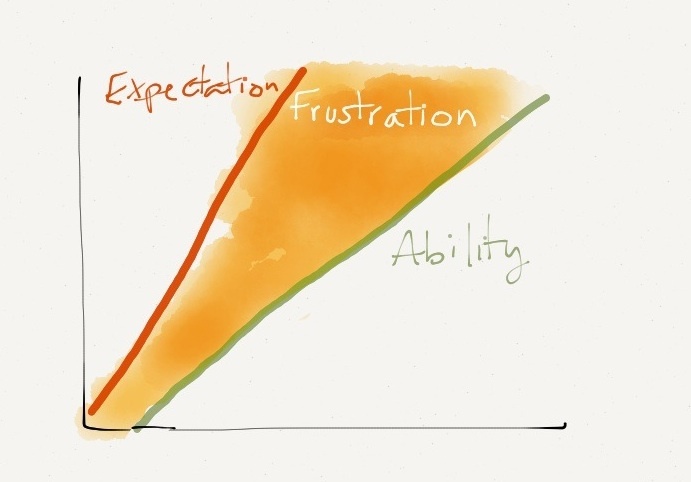 As your skill and your exposure to a domain grow, your expectations grow and your tastes develop, but your skill may not grow at the same rate. That’s the case with me. Inevitably, I compare myself to the professionals who have had years of practice, and judge my amateur work against theirs. Therein lies the problem. When I started photography, merely using a high quality camera with a shallow depth-of-field was enough to meet my expectation of a “good photograph”. However, as I interacted with more photographers, read about photo techniques, had my work critiqued, and refined my taste in photography, I realized that my ability to execute had lagged far behind my expectation. Every photograph became a failure, every photo walk a chore. Every hobby I’ve picked up has a similar story, except for reading, writing and cycling. I think the feedback loop is so tight in those activities, that any input of effort, has a clear and obvious impact on the output. This concept isn’t new. In fact, the realization came mostly from reading “Flow”, which I already wrote about in A Moment of Clarity in the Pursuit of Happiness. The question remains though, what can be done to fix it? I can set personal challenges that let me operate at the limits of my skill for any of my hobbies. For example, instead of trying to “make a good photo”, I can take an existing photo that I like, and reproduce it. I can set myself a goal of reading a certain number of “favorites” on Flickr. I can decide that I want to make some money from my tailoring. Those are clear goals that I can work towards. Achieving a goal gives me the positive feedback I need, and increasing the challenge as my skill grow will close off the loop. Eventually, the skill will grow enough with practice to close the gap with my expectations. Until then, I need to put my expectations aside and work towards an achievable goal. If you’ve ever struggled with the same problem, I hope this works for you, it’s certainly working for me.